Every week I get to surf the dozens of blog posts in our little corner of the internet. And every week I’m amazed at the quality and quantity of what I find there. Inspiration is, truly, where you find it, and even though people back east probably can’t even read this, today I’ve got some thoughts on the book creation process, more on how to sell ebooks, a warning about subsidy publishers, the limits of ebook formatting, and being careful online. Have fun. Have you heard of Indie Recon? It’s a free event coming on February 19 and running through February 21. 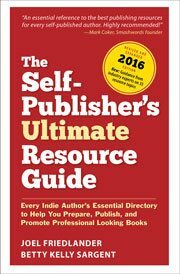 It’s also an online conference featuring over 25 guests who will discuss the nuts and bolts of self-publishing from the pros / cons all the way through marketing and being a bestselling author. This is a new event, but the organizers have done a great job putting together a program that’s packed with information, tips and strategies you can start using today. I’m happy to say that The Book Designer is a sponsor, and I’ll be participating too. Since it’s free, take a look and see if there isn’t some of the events you could profit from. And here’s the registration page: (look in the left sidebar to sign up) Indie Recon. Thanks for the great set of articles, packed with help I need right now. The whole safety thing with social media is unnerving! On the other end, Indie Recon looks fascinating. Thanks for the heads-up about Indie Recon … I’m signed up and ready for action!